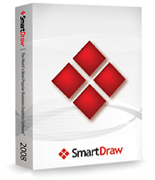 SmartDraw is one of the most popular graphics software. It can be used for many purposes from creating flowcharts, high quality illustrations and diagrams, project management chart, floor plans, landscapes and so on. One can use the excellent templates available to jump start the process or start from scratch depending on the level of comfort and the nature of the drawing. One advantage of SmartDraw is its short learning curve and one can create professional quality illustration, diagrams and charts in a matter of minutes. While a creative and expert artist can make the drawings and illustrations come alive, an average user can also create high quality charts and figures. The short learning curve and ease-of-use are two factors that make this exemplary product more popular and usable.